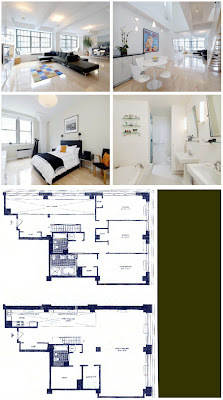 ...that Oscar nominated Hollywood hawt-stuff Kate Hudson just might be shopping for new digs in New York City. The bubbly and beauteous Tinseltown royal used to shack up in a TriBeCa loft when she was a-courtin' with bearded Black Crowes ex-huzband Chris Robinson. But according to all the tabs and glossies, after getting hitched the couple lived primarily on the Left Coast in a Pacific Palisades house in which the now dee-vorced Miss Kate still reportedly resides. Your Mama heard from Little Miss Muffit that the single mommy of one long haired boy child recently checked out a $5,200,000 duplex at celebrity friendly 27 N. Moore in TriBeCa. Now babies, Your Mama does not know Miss Kate or any of her peeps, so we can't confirm if this is true. It's just a rumor puppies. Idle gossip. It is possible she was just looking with a well to do pal, however, Little Miss Muffit provided Your Mama with an actual photograph of the lovely young Miss Kate holding marketing materials for the 3,419 square foot unit (pictured above) that includes 3 bedrooms, 3 bathrooms and an impressive but difficult to heat 22 foot ceiling over the kitchen and dining areas. No word on whether she liked it. Anyone care to fill Your Mama in on that? That's the same building where JFK Jr had an apartment.The only problem with Tribeca though is that it's all Wall Street Mommies who will run you down with their thousand dollar strollers just for fun! Ah, stroller cage fights! Two mommies enter; only one leaves. I like this floor plan and the space looks comfortable, stylish and airy. The blindingly white walls every where are a bit played, but perhaps Ms. Hudson can add a splash of color here or there. Alessandra,do you know what channel that's on? So_Chic, dear, I'm going to send over a couple yoga sticks for you to carry when you go out on the street. I do worry about your safety what with rampaging high schoolers and ninja stroller mommies. Also be sure to button up and wear a nice cashmere muffler. It's so cold. Don't forget sun screen. I guess that's all for now. Yes, the space is airy and stylish, but unless you have really spectacular art to showcase, it is a little cliche. I think all white is the lazy decorator's way out, just as all black is the lazy designer's way out. Oh, kids, I'm afraid I'm too old and weary to much care anymore how people decorate their excessive spaces on millions of dollars. I'm looking for a blog that extols the shop girl's creativity in decorating her 300sf studio on a shoe string. Forgive me, Mama. Aunt Mary we haven't even talked about the swarms of Europeans that has overtaken us now have we? Don't leave us my dear. I know huge expanses of all white is the trend to keep such large spaces from acquiring that behind-the-plastic-flaps-in-the-back-room-at-Home-Despot look, but just a little more color, please! And not just artwork; some accent colors on the walls and a center piece or two of bold furniture. The few color accents here are of such a muted palette they might as well not even be there; they fade away into the background. Go bolder . . . an accent wall of the eye-popping variety for fun and contrast; lord knows with those windows there's plenty of light. I like the pedestal sinks in the bath, but glass shelving over the tub? No, no, no! But it is a nice layout with the huge windows, open staircase, generously proportioned and well laid out rooms; and the blond wood floors are lovely. My one concern is cooking smells wafting up to the bedroom floor through the double height opening by the stairs. Can't tell for sure on the plan but it looks like it can be closed off. And as for the mommy terroristas, I always have my fun with them by leaning over their Aprica strollers, studying carefully and then exclaiming, "What a cute little monkey! What's its name? Bubbles?" The fun is doubled when you get one with a twin stroller set and I ask them, "Which one's human?" Instant Starbucks spray from their recently enhanced noses. Breath. Don't get your compound adjectives twisted in a knot. This isn't real, it's formula staging and an f/2.8 fisheye lens. I promise, the new owners will make it nice, with lots of color and tasteful pieces. We'll have to wait and see how they feel about errr... drywalling off the bedroom. We can only dream. I actually like the white. There is nothing that excites me more than white walls! I love it how you can tell Mariah is home by the fleet of yukons surrounding the front. to the little gay boy, i am concerned. are you all right? you seem to be a monolith of many things said before you. you seem to be waivering with no agenda or sense of adult reasoning. And just what form would this "help" entail? Past life regression, crystals, smudging, or more intensive one-on-one therapy? that's not the same address as Ms Carey! I'm sure if Ms. Penny Lane takes this place, it will be California'd in no time with her Moroccan throw rugs, Nag Champa incense and Fig candles.